Software developers and web designers spend a lot of time working with editors. The Scribes text editor  provides an option that is visually neat, yet functionally surprising – in a fairly low version number. Integrating the program into your system is also easy (see the "Installation" box). 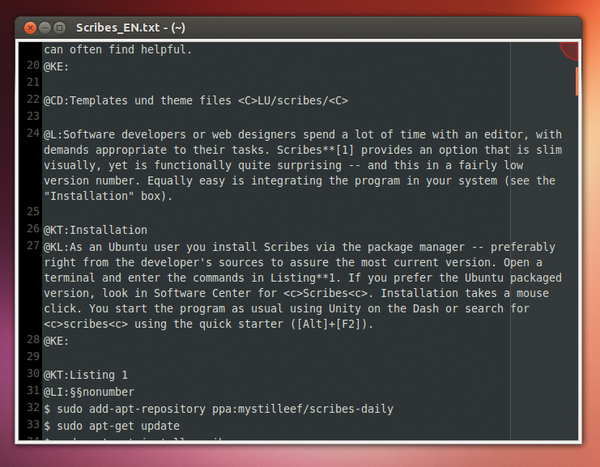 As an Ubuntu user, you install Scribes via the package manager – preferably right from the developer's sources to ensure the most current version. Open a terminal and enter the commands in Listing 1. If you prefer the Ubuntu packaged version, look in Software Center for Scribes . Installation takes a mouse click. You start the program as usual using Unity on the Dash or search for scribes using the quick starter (Alt+F2). Once you start Scribes, the tool creates a new file for you. Some users might be surprised at first, because instead of menu bars and icons, you'll see a practically blank screen. The only thing you can see is the cursor and a line number on the left (Figure 1). Figure 1: Scribes presents itself with an almost empty screen and a neat user interface. To open an existing file, just move the cursor to the right-hand corner of the workspace, which opens a temporary icon bar. A single click of the folder icon opens a dialog of file names, or you can use Ctrl+O. Clicking the document icon (or typing Ctrl+N) opens a new file. Little details often make software convincing in an everyday way. In Scribes, these include functions such as autocompleting character pairs. If you enter a left round or square bracket, you don't need to worry about the matching right one – the editor adds it for you. With Alt+right-arrow, you move text in; with Alt+D, you delete an entire line, regardless of whether it has content. The autocompletion function also applies to terms – no mean feat for a program of this type. Prolific writers and developers that use the same variables or expressions repeatedly can save themselves a lot of time. The program considers only expressions of more than four characters when autocompleting. If the algorithms detect that you may want to type a previously used word while you're writing, the program shows a list of possible terms. You can then use the arrow keys to choose the appropriate one from the list and add it with Enter. When you think of CMS and blogs, names such as WordPress, Typo3, and Joomla come up. But often, much leaner solutions will suffice. If you want not only to enjoy e-books in EPUB format but also to create them, take a look at the easy-to-use and versatile editor from Sigil.